The Filr desktop application for Windows is supported on Windows XP and later. 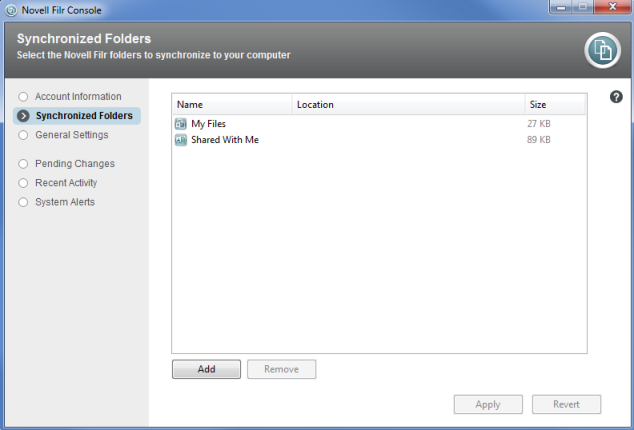 My Files: Files that are located in your My Files area on the Filr site are synchronized to your workstation by default. 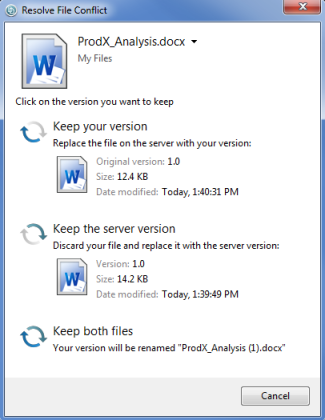 When you add files to the My Files folder from your workstation (C:\Users\userid\Filr\My Files/), the files are automatically synchronized to Filr at the next synchronization. Shared with Me: Files that are located in your Shared with Me area on the Filr site are synchronized to your workstation by default. You can edit files in your Shared with Me area and the edits are synchronized to Filr. However, you cannot add files to the root of the Shared with Me folder from the Filr desktop application on your workstation (C:\Users\userid\Filr\Shared with Me/). If you do, the files are not synchronized to Filr. You can add files to folders that have been shared with you, if you have Contributor rights to the folder. Files located at the root of the C:\Users\userid\Filr folder cannot be synchronized. Instead, add files to one of the appropriate subfolders (My Files or Net Folders; you cannot add files to the Shared with Me folder). After the download finishes, open the NovellFilrSetup-x86.exe file or NovellFilrSetup-x64.exefile, depending on whether you have a 32-bit or 64-bit operating system. In order to view the Filr properties of a file or folder (as described in Viewing Filr Properties for a File or Folder), you must have the Microsoft .NET Framework 4.5 and Microsoft Visual C++ 2013 Redistributable Package installed on your workstation. If .NET Framework 4 is already installed on your workstation when you install the Filr 1.0.2 desktop application, you must install .NET Framework 4.5 separately. All other functionality associated with the Filr desktop application is available with .NET Framework 4. 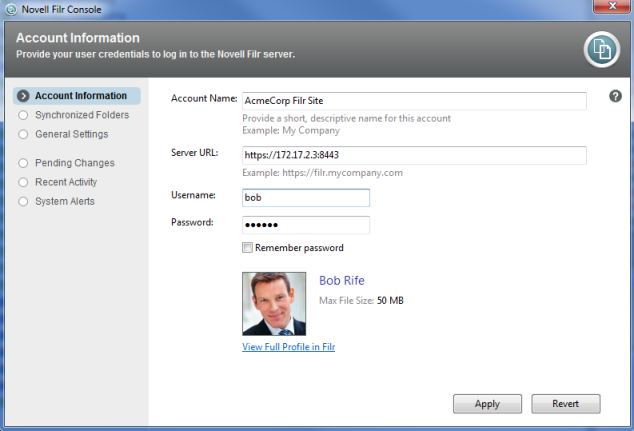 Change the installation location for the Filr desktop application, or simply click Next to accept the default location. Click Finish when the installation is complete, then continue with Configuring the Filr Desktop Application for the First Time. The Filr desktop application is now running, and the Filr icon is visible in the notification area. Double-click the Filr icon in the notification area. Right-click the Filr icon in the notification area, then click Open Filr folder. On Windows Vista, the Filr folder is also located in your Favorites. On Windows 7 and 8, the Filr folder is also located in your Favorites and in your Libraries. Right-click the Filr icon in the notification area, then click Synchronize now. Right-click the file, then click Synchronize now. Right-click the Filricon in the notification area, then click Visit Filr on the web. Right-click the file, then click Comments. Hold the Ctrl key and select the users in the Shared with section whose access settings you want to modify. Click Properties to launch the native Windows properties dialog. 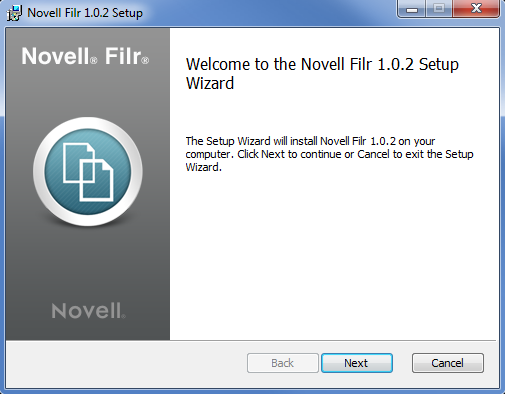 Click the Novell Filr tab. The Filr properties for the file or folder are displayed. Right-click the Filr icon in the notification area. Click the Start icon, then click Control Panel. 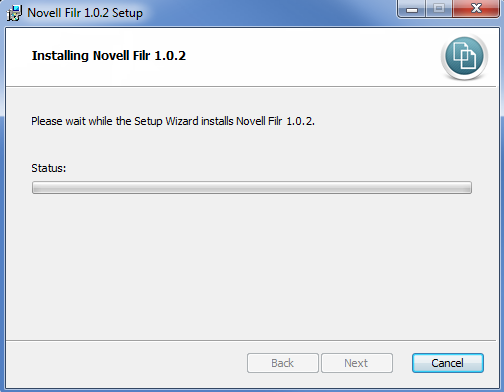 Select Novell Filr > Uninstall. Click the Start icon, then click Run. If Run does not appear, type Run in the Search field, then press Enter. Click User Accounts and Family Safety > Credential Manager. 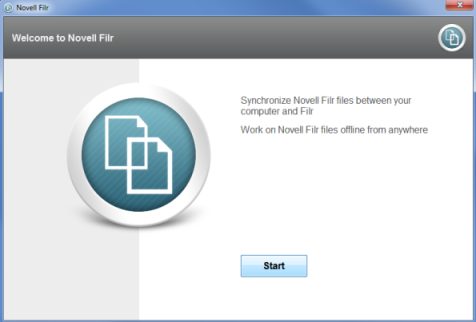 Remove credentials beginning with Novell.Collaboration.Filr. Click the user account that you are logged in as. Click Manage my network passwords. After the Filr application, metadata, log files, and credentials have been deleted, empty the trash (double-click the Trash icon, then click Empty the Recycle Bin).